Being the nearest planet to Earth and having similar conditions, the Red planet has always held the imagination of astronomers, mythologists and writers of science fiction and fantasy alike. 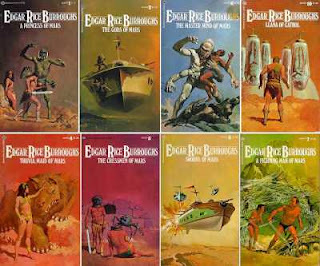 Edgar Rice Borough's Barsoom series was one of the earliest science fiction series based on Mars. Barsoom is the local name given by the inhabitants of Mars for their world. Edgar Rice Boroughs was not a typical science fiction writer as such. He was more popular for his Tarzan of the Apes series. The way he approaches the stories in the Barsoom series is also closer to swords and sorcery fantasy than pure play science fiction. But then the lines between science fiction and fantasy are not so clearly drawn. I remember asking my professor in my first class of a course ’Introduction to science Fiction' the question on the difference between science fiction and fantasy. His reply was, "When a fairy God mother waves her wand and transforms a pumpkin into a chariot, it is fantasy. On the other hand if a scientist bombards a pumpkin with fluoride ions from a matter replicator and creates a space craft it is science fiction." The import being that it is essentially scientific jargon that differentiates science fiction from fantasy. I personally would define fantasy as something purely based on imagination with no basis on reality whereas science fiction tries to explain the imagination by extrapolation of known scientific concepts. Getting to the Men of Mars series, what I like most is the way Boroughs has managed to create a complex alien culture consisting of the red men, the green men, the yellow men, the white men, black men and Kaldanes. Writing a story set in the real world is a challenge as one has to research a lot and connect your story to the real life places and events. On the other hand fantasy/science fiction is altogether a different challenge. Here you need to create worlds with their own consistent history, economy, politics, religion and technology. And then if it is an alien world, probably one has to create the world's own flora and fauna and intelligent life. Edgar Rice has managed to live up to this challenge, he has in fact done a much better job than many of the later science fiction/fantasy writers who usually try either to create a purely human world or try to set their stories in worlds created by other writers. He has especially done a great job with creation of the terrains and landscapes, the structures and the insentient life. He has also tried to give it a ring of reality by making Mars a dying desert planet going along with some of the scientific theories of the time which suggested Mars might have been an inhabited planet where life had died out before life began on Earth. This series introduces lot of interesting ideas that are explored in depth in later science fiction/fantasy stories. One of them is the possibility of old world Gods being powerful aliens whose powers were thought to be supernatural and men according to them status of Gods. This is seen in ‘Thuvia, the maid of Mars’ and ‘War lord of Mars’. It is an interesting allegory of the real world society where religion is used as a tool to consolidate political and economic power. We see this idea of powerful aliens playing Gods over younger races fully developed in the television series ‘Star Gate’. One more key concept in Star Gate probably originated from this series - the concept of intelligent species with only brains developed and limited physical development using bodies of other beings as their crafts, living as a parasite. This is seen in ‘Chessmen of Mars’. In the book ‘Chessmen of Mars’, Boroughs has managed to create a fascinating game called Jetan with its own complex rules. Quidditch of Harry Potter probably was not the first game invented by an author for a story. If the reader is looking for convoluted plots and subtle development of character, they are in for disappointment. Most of the stories in this series follow more or less the same pattern of a cow boy hero undertaking hazardous journeys fighting his way through obstacles posed by the terrain and monstrous life forms culminating in a battle of good versus evil. The goody good hero triumphs over the callous villain and rescues the damsel in distress. The journey ends in lovers meeting and they live happily ever after. Amen. This series is an ideal read for the casual reader and those who enjoys mindless action and a slug fest. However a serious science fiction/fantasy reader would be making a serious mistake by choosing to ignore this work. This series scores for its sheer depth of imagination. It can be considered a pioneer for the more complex future works: a must read for any die hard science fiction reader. The one who can give it a miss is the highbrow literary reader who turns his nose down at sci-fi. Thanks Suresh. Guess that was the case. Now it was evolved so much. But we are yet to move much in that direction on real world. Do you remember the Flash Gordon series of comics :) ? Some of the stories had a solid sci-fic plot in them! Thanks Mahesh. Indeed I do. This blog is not just about books but all forms of media where SF, fantasy and history feature. Will do a series on comics as well. That was a crisp introduction to Edgar Rice Boroughs' Barsoom series. The lines between life, religion, fantasy and science fiction are deeply intermixed. Thanks for the post. Very true, Mr. Umashankar. That is why one can't have interest in one without having interest in the other. I haven't done the analysis, Connor. But the books are available for free download. Possibly you can read and analyze. Should be an interesting exercise indeed.